A bipartisan coalition in both the House and Senate are pushing legislation that would authorize all state and local governments to divest taxpayer funds from any company that engages in boycotts of Israel, according to interviews with lawmakers and a copy of the bill obtained by the Washington Free Beacon. 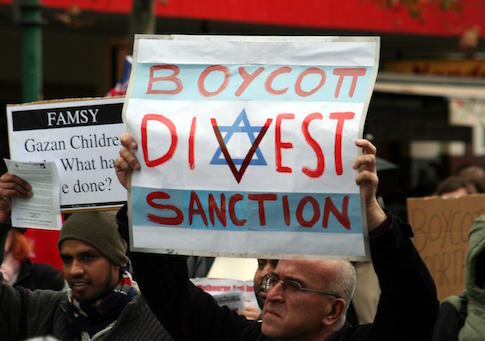 The new bill, which was filed Wednesday afternoon, marks an aggressive push by lawmakers on both sides of the aisle to combat the growing Boycott, Divestment, and Sanctions movement, otherwise known as BDS, which advocates in favor of economic war against the Jewish state. The bill would provide legal shelter to states seeking to divest taxpayer funds from any company that has backed the BDS movement. It also would set a legal precedent granting safe harbor for private investment companies to do the same. The legislation comes amid a new move by the European Union to single out all Jewish goods produced in disputed areas of the West Bank, an effort that the Obama administration has supported. Lawmakers leading the anti-BDS charge told the Free Beacon that the bill is a shot across the bow to a growing coalition of anti-Israel organizations that have lobbied state-level officials to boycott the Jewish state and products produced there. Congress hopes to draw a line for the Obama administration, which has long been criticized in pro-Israel circles for straining U.S.-Israeli ties through policies that isolate the Jewish state. After the political fight over the Obama administration’s nuclear agreement with Iran—which Israel opposes—lawmakers on both sides of the aisle are seeking to reassure Israel that Congress continues to stand by its side, Sen. Mark Kirk (R., Ill.) told the Free Beacon. "After the big Iran fight, it was the right time to set a pro-Israel marker down there with members [of Congress] against the BDS movement," said Kirk, who is jointly pushing the Senate version of the bill along with Sen. Joe Manchin (D., W.Va.). Reps. Bob Dold (R., Ill.) and Juan Vargas (D., Calif.) are spearheading the House version of the anti-BDS legislation. "It’s a powerful step to make sure that those around the country that want to send a very clear signal that we are standing shoulder to shoulder with Israel, that we will not stand idly by and let individuals and entities out there target, boycott, divest or sanction Israel in any way shape or form," Dold told the Free Beacon. "This is an offensive opportunity." The bill employs similar legislative tactics used to encourage states and local governments to divest from companies doing business with Iran. Both Kirk and Dold expressed concerns that a growing wave of anti-Semitism in Europe could spill over into the United States and add fuel to the BDS movement. "We see the Muslim community and the Arab community having a political impact in the key allies—Germany, the UK—where something like BDS could catch fire and become official policy," Kirk said. "There needs to be some pushback from the best friend of Israel." Dold agreed, noting that with relations between the United States and Israel at an all-time low, Congress must set down a marker. "I’ll call it what it is—the absolutely wrong approach," Dold said, referring to the EU effort to label Israeli goods, a policy that most pro-Israel groups view as anti-Semitic. "Our greatest ally is Israel and we need to make sure we’re sending a very clear signal," Dold said. "This is unacceptable: We are going to try to make sure we are going to provide cover for states, for local governments … I think it’s important they know the federal government here stands with them." Pro-Israel organizations that work with Congress have long been pushing for this type of legislation, saying that it could help deflate the BDS movement in America. "Congress isn't messing around," said Omri Ceren, managing director at The Israel Project, a D.C.-based organization that has been at the center of fights against anti-Israel boycotts at the state and federal levels. "Polls show that their constituents want lawmakers at every level of government to stand with Israel, and senators and representatives are going to do everything in their power to make sure that happens." However, there is disagreement within the pro-Israel umbrella about the value of such legislation. Some maintain that anti-BDS legislation violates the First Amendment and violates existing U.S. policy. J Street, an organization that bills itself as pro-Israel but that has been criticized by some in the mainstream Jewish community, has lobbied lawmakers to oppose similar anti-BDS efforts, according to a copy of an email that group has been sending to lawmakers since last year. J Street quietly came out against a House resolution last year that expressed disapproval of the EU’s boycott effort. J Street and other who share its position accuse Congress of trying to legitimize "Israeli settlement activities." "There are many other ways for your boss to express concern over BDS against Israel without defending settlement activity or undermining a two-state solution," J Street argued in its letter to lawmakers. When asked about the potential opposition to the new bill, both Kirk and Dold were dismissive of J Street and its supporters. "We know there is opposition," Dold said. "Which is more reason why this had to be done. This isn’t partisan and I think it’s absolutely critical we make sure it’s not. This is about doing the right thing. It’s not left versus right. It’s right versus wrong." This entry was posted in Issues and tagged Israel, Mark Kirk. Bookmark the permalink.